After spending decades forgotten somewhere in a film canister, a film of previously-unknown footage showing aftermath of San Francisco’s devastating 1906 earthquake and fire will finally go on public view. English photo collector Jason Wright purchased the reel of film from historian David Silver who discovered it at a flea market. After premiering the footage at a pair of film festivals, Wright plans to post the video online, giving the public its first chance to see the footage which is credited to the Miles Brothers, San Francisco’s first film company. Wright allowed NBC Bay Area News to premiere the video in its newscast Sunday night. "This is for the people from San Francisco," Wright said. "This film was saved for them and they deserve to see it." Newly discovered film footage by the Miles Brothers shows workers using dynamite to blow-up parts of San Francisco City Hall following the 1906 Earthquake and Fire. The Miles Brothers are well-known for the now-famous footage called A Trip Down Market, which captures the bustling chaos on San Francisco’s Market Street from a moving trolley car. Film Historian David Kiehn, who runs the Niles Essanay Silent Film Museum in Fremont, used clues in the video to pinpoint the day of the filming to just four days before the 1906 Earthquake which struck in the early morning hours of April 18. "To think it was only four days before the earthquake gives you a kind of like a perspective on these people and what they were going to enter in a few days later is kind of sobering," Kiehn said. The newly discovered footage retraces the Miles Brothers earlier journey up Market Street toward the Ferry Building, only now the camera captures mass devastation on both sides of Market Street. "You can see here the body language is a lot different," Wright said, watching a copy of the footage. "There’s not as much hustle and bustle. There’s no smiling people and kids running in front of the camera." 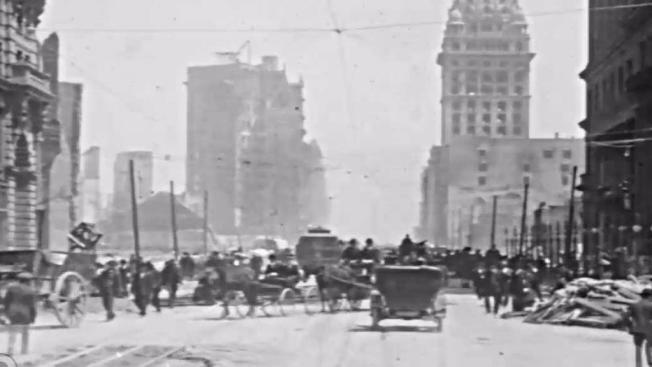 A still photo from newly discovered footage of the 1906 Earthquake and Fire shows people walking along devastated Market Street near the Ferry Building. Wright said scaffolding outside the Ferry Building led he and Kiehn to conclude the footage was shot about two weeks after the quake. A sign outside a store alerts customers that the business is "now open." He said the new video shows elements of the disaster that hadn’t been seen before, such as the large industrial machinery called "steam donkeys" which were used to pull down the old buildings. Another fresh perspective is the sight of hundreds of people in buggies filled with belongings waiting to board ferries at the Ferry Building. Film historian of the Niles Essanay Silent Film Museum shows a vintage camera similar to the one used by the Miles Brothers to film footage of the 1906 Earthquake and Fire devastation. "This just shows the real business end of what was happening, the effects of the quake on San Francisco and everyone getting the heck out of there," Wright said. Kiehn digitized the film at his museum and was flabbergasted as the long-forgotten frames slowly came to life. "That was pretty exciting to think I was the first person to see this stuff in decades," Kiehn said. "I think the film adds another piece to the puzzle of film history and the Miles Brothers history." Vintage photography collector Jason Wright shows footage of the newly discovered film depicting San Francisco following the 1906 Earthquake and Fire. Kiehn said the four Miles Brothers shot more than two hours of footage following the quake, but very little of the footage survived. However, the discovery of the new film left him hoping more footage would turn up. "To think that this film had been around all these years, laying there waiting to be discovered kind of gives you hope there’s more stuff out there waiting to be found," Kiehn said. Wright is in the process of loading the video to a YouTube site. In the meantime, he plans to load instruction on how to see the video at his own site.